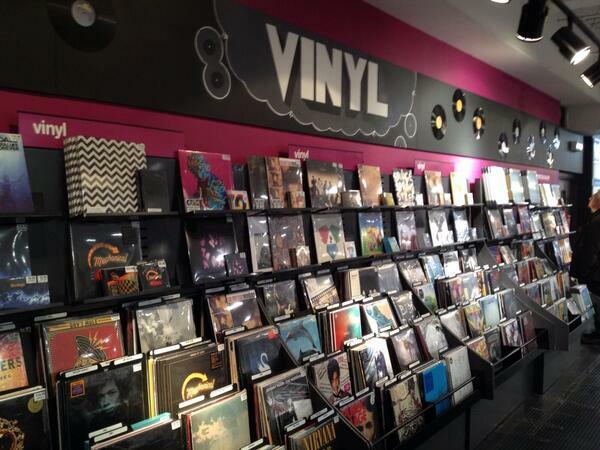 How much vinyl can you stock if you aren’t paying for it ? How much vinyl can you stock if you aren’t paying for it ? Well obviously quite a lot. HMV/FOPP’s “new deal” in which they only pay for stock once it is sold has repercussions at several levels. First of all they needn’t worry about when anything they order will sell. Any independent worth their salt will be looking to sell by the end of the following month or they will be paying for unsold stock. Again even the best sellers sell inconsistently so caution has to be shown and even if a title sells regularly it can often only sensibly be ordered one at a time. No such worries for HMV/FOPP. They can just fill their boots. This in itself causes titles to go out of stock as all the stock is sitting in the racks of HMV/FOPP and so any independent wanting to order is out of luck. Of course even with no guarantee of a sale taking such quantities means better prices can be negotiated and there is no need to factor any risk into the price so surprise surprise they can undercut the competition. New releases notoriously difficult to get right these days are no problem at all. They can just take all the Daft Punk vinyl and see how it goes which funny enough is surprisingly well when the independents are told there won’t be more stock for them for three weeks. It doesn’t have to be vinyl of course. A host of deluxe CD editions have gone out of stock in the last month or so while HMV/FOPP’s racks overflow. So just to recap essentially HMV/FOPP can order what they want, not pay for it until it is sold, deny independents sales by holding stock that is out of stock at the distributor and just to rub salt in the wound undercut on pricing. This is the reward for a company bought so cheaply by its new owners that it was unable to honour its pension commitments. Don’t get me wrong I understand the importance of HMV to the music industry but its survival should not be at any expense with regard to the independents. As somebody who had headed the Coalition of independent shops I was recently approached twice in a week by music industry “bigwigs” to see if there was anyway the independents could again work together and provide some sort of buffer. If not I was warned “there could be a massacre”. I had to say that with such a variety of interests and survival strategies I doubted I could pull half a dozen meaningful shops together. The surprise was that he was coming clean now. I’d not expected them to admit they were essentially looking to take business from the independents and expand the number of FOPPs until after Christmas when they would be hoping to report that at least Christmas hadn’t been a complete disaster unlike the previous year that had driven them into administration. There is of course a built in flaw to this strategy for improving business and that is that sadly the independents have a tiny share of the market and the vinyl they so heavily trail has an even tinier share. They could take it all and it wouldn’t solve their problems. Of course taking just a small share of Amazon’s sales would make a huge difference so I looked with interest to see how they intended to take on the “big boys” they had once claimed gained from an unlevel playing field. My understanding was that they had no intention of taking Amazon on in physically sending product to customers and instead would simply offer a risk free downloads option. When Hilco took over, HMV could no longer afford to stock as many artists as it should. We’re putting a lot of effort into improving that. We need to stock as wide a range of music as possible. Band merchandise is something we want to engage with as well. You’ll see a good selection of T-shirts, mugs and so on for the bigger acts like The Beatles and The Rolling Stones, and it’s something that will get bigger. When HMV was in a far better state it still failed to carry a great range of stock and FOPP was more interested in selling CDs at bargain prices than supporting catalogue sensibly. Of course if you haven’t got to pay for the stock etc etc etc. And yes that is right expect more merchandise from the Beatles and the Stones because you can never have too much of that !!! They will be supporting “the bigger acts” so as we were really. HMV got left behind in the digital revolution and didn’t have a digital presence for too long. We need to quickly get HMV up to speed, and will be announcing a relaunch of our digital side within the next month, so that people can buy from us in the way they want. This is not 100% clear as they have also said they would relaunch their website but I assume the website will be a digital store as they declare “that people can buy from us in the way they want” because nobody wants to buy music physically online anymore. Maybe not. Maybe they will take on Amazon and if so good luck with that ! We rescued the nine remaining Fopp branches as part of the HMV deal. We’ve been examining what’s going on the independent record store market and learned some good practice there, which we can act on via Fopp. It’s quite a different brand from HMV and we’re looking to expand the number of Fopp stores. So see where independents are still surviving/doing well and open a FOPP rather like the last FOPP expansion plan that went so well ! Blur played on the roof at 363 Oxford Street in 1995, and we want the return of event appearances like that. But it isn’t just about big names. Our Irish branches have specific evenings dedicated to breaking local new bands, and that’s something to consider in the UK too, as part of interacting with the music industry. Around October 18th, we’ll be announcing one of the biggest names in the world as playing a gig at our newly-reopened flagship store at 363 Oxford Street in London. So it’s not about the big names but they’ll be announcing a big name soon. And those Irish shops that didn’t end well last time at all did it ? We’re building a programme that will let local staff to decide how high a percentage of product goes into their stores. So many cities have local scenes, and they need to be represented in our stores. Not exactly the first time HMV have said this. They try it briefly, see there is no money to be made and quietly drop it. So given Avalanche is one of those shops facing the double-barrelled assault do we have a plan. Well yes but I can’t tell you as before we could implement it it would be adopted as best practice by FOPP/HMV and we’d be sold down the river by the record companies in a heartbeat. Quite a while ago when Amazon was first seen as being a threat to stability in the music industry I was speaking to an industry insider much wiser and indeed older than myself as he explained the reasoning behind record companies thinking in relation to Amazon and HMV. “Imagine” he said “that Amazon are the Nazis and they need to be stopped or at least halted at all costs. To do that we need to work with the Russians otherwise known as HMV”. And who I said are FOPP at that point a much larger and aggressively expansive chain. The Second World War analogy broke down as in an instant he said “The Daleks”.